Students returned to a Catholic school Friday to pray for two eighth-grade girls involved in a shooting two days earlier in the crowded cafeteria. "I'm looking forward to putting everything behind me and just getting back to normal," said Patrick Buckheit, 15. Buckheit said he was in the cafeteria Wednesday when 14-year-old Elizabeth Bush allegedly shot 13-year-old Kimberly Marchese in the shoulder. The suspect's father, Gerald Bush, told The Patriot-News of Harrisburg that his daughter "seemed maybe a little depressed" that morning. Her attorney, George Lepley, has said she endured "name-calling and slurs and innuendoes," some of it by Marchese. Marchese, who went home from the hospital Thursday, said she and the suspect hadn't argued or even spoken for at least a week. "I just want to ask her why she did it, if I was the target or not," Marchese told ABC's Good Morning America. "She sometimes says stuff and then she'll regret it, and I think that's just what happened to her with the shooting." But while the Marcheses suggest there was no feud, the police and the Bush family believe there was one. Lepley, said Elizabeth sent Marchese an e-mail a few weeks ago. "I think the e-mail to Kim was about, 'Why can't we be friends. Let's get past this and move on,"' Lepley said. He declined to discuss the nature of the problem between the two girls. Marchese did not return to Bishop Neumann Junior-Senior High School on Friday, but her father, Michael Marchese, attended the private prayer service. "She said, 'I miss my friends, Dad.' But we're going to wait until next week," he said. "I just wanted to go in for a couple minutes to say hello and let them know how she's doing." Elizabeth Bush was being held Friday in a juvenile detention center pending psychological evaluation. She was charged as a juvenile with attempted homicide and aggravated assault. 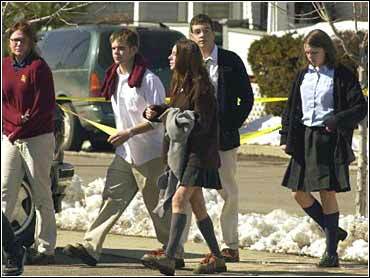 Hours after the shooting, the girl was unaware that someone had been shot, according to her mother, Catherine Bush. Bush said she spoke with her daughter for about five minutes on the phone Wednesday night. "I am the one who told her somebody had been shot. She said, 'I didn't shoot anybody.' She said 'No, I saw Kim running for the door,"' Catherine Bush said. "I don't think she realized what happened." Bush's parents spoke to the media Friday at their lawyer's office. A school secretary who declined to give his name said most of the school's students showed up Friday for the prayer service. Marchese described Bush as a disturbed girl who had emotional and family problems. "She wasn't in the best health mentally," Marchese said. "She cut her wrists, but she got help with that. She told me she used to be able to talk to God, but she told me she doesn't hear him any more." Marchese said that couple of weeks ago Bush had told people her sister had a blood disease and that people should pray for her. "I know she was going through a really hard time," Marchese said. Before attending the Roman Catholic school, Bush had attended public school in the Jersey Shore Area School District. When she went there, classmates on the school bus would call her a homosexual and other names or even throw stones at her after school, her mother said. Problems persisted at the new school. Gerald Bush said he had taken his daughter to a shooting range several times in the past six months. The .22-caliber revolver used in the shooting was one that his daughter took from his collection, he said, adding that it was not locked up. Lycoming County District Attorney Tom Marino said his office has not yet explored the possibility of charging Bush's parents with any crimes related to the gun. Factors in the decision will include the girl's age and her parents' handling and storage of the weapon, he said. About 230 students in grades 7 through 12 are enrolled at Bishop Neumann Junior-Senior High. Williamsport, home to the Little League World Series, is in central Pennsylvania, about 160 miles northwest of Philadelphia. The shooting came two days after a teen-ager opened fire with a pistol in a school in Santee, Calif., killing two people and injuring 13. School administrators there did not tell students Wednesday about the Pennsylvania incident.